TALLADEGA, Ala. -- Pontiac left NASCAR six years ago. Only the memories remain. If Friday's reports are true, the Pontiac brand will be a memory soon for everyone. Pontiac apparently will not survive GM's restructuring plan. 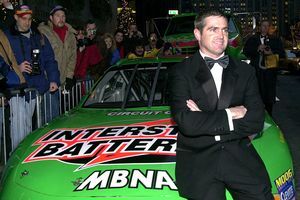 AP Photo/Stephen Chernin Pontiac started the decade on top of the NASCAR world, with Bobby Labonte as champion. The brand is apparently not going to make it out of the decade. A more serious concern at the moment for NASCAR is Dodge, which also is teetering on the brink of extinction. Parent company Chrysler probably needs to merge with Fiat by the end of the month or go into bankruptcy. By the time the Cup teams get to Richmond next weekend, things could change for seven drivers at two organizations (Penske Racing and Richard Petty Motorsports) that race Dodges. Kurt Busch, who drives the No. 2 Dodge for Penske Racing, tried to look at the bright side on Friday. "It's exciting for me because [Fiat] is affiliated with Ferrari," Busch said. "Maybe there would be a chance to get a Ferrari out of this deal." Might as well laugh to keep from crying, but Busch knows it's a bad situation. "None of us have control over what happens up in Detroit," Busch said. "We hope the best things for Chrysler and everybody involved. "I know that [Chrysler CEO] Bob Nardelli and Roger Penske are very good friends. I know that they'll work through it the best way that they can to make everybody happy." No one knows what the Dodge teams would do if the brand no longer existed. Hopefully, Dodge won't join Pontiac in the dinosaur category. It was only seven seasons ago when Tony Stewart won the Cup championship in a Pontiac, two years after Bobby Labonte's Pontiac gave Joe Gibbs Racing its first Cup title. The Pontiac brand won five championships in NASCAR's top division, starting with back-to-back titles by Joe Weatherly in 1962-63. Rusty Wallace's only Cup crown came in a Pontiac in 1989, driving for team owner Raymond Beadle. Dodge left the Cup series after the 1985 season, but returned in 2001. Dodge hasn't won a championship since returning, but Dodge and Chrysler have a rich history in the sport. The Dodge brand has four championships -- two with Richard Petty (1974-75) one with Bobby Isaac (1970) and one with David Pearson (1966). But Chrysler has eight other Cup titles, starting with Lee Petty with his Chrysler in 1954. Five of Richard Petty's Cup championships came in a Plymouth, also a Chrysler brand. Now Chrysler is trying to survive. What happens next week could decide its fate.